Yesterday, Jeremy and I went to the first "official" ultrasound for the twins. I can't put into words how I feel watching an ultrasound. It is so amazing how little, black and white blobs on a screen can make you feel! Both babies were squirming around, and both had perfect heartbeats. We are in love already. As far as the technical side goes, there are two amniotic sacs, two chorionic sacs, and two placentas. This is the safest way to have twins, we were told. It also means that they most likely are fraternal. There is a small chance they could be identical, but it makes more sense to assume they are fraternal. They both are the exact same size, measuring right on time (10 weeks as of today). The hope is that they continue to be the same size. The ultrasound tech also told us that I ovulated from my left ovary... I don't know why you need to know that, but I found it interesting anyway. The doctor we spoke to went through pretty much all the information we needed to know about twin pregnancy. I'm considered high risk because of the twins, but the doctor assured us that all of the risks are small and manageable. I have a higher chance of developing gestational diabetes, and a higher chance of preterm labor. Apparently, around 50% of twins are born between 32-36 weeks. I am praying to make it to 38-39 weeks. If family history is any indication, I believe I can make it that long (my mother was 5 days LATE with her twins!). Even if they are born in that 32-36 week range, there would be no long term complications. Quite a bit of the time we had with the doctor was spent talking about delivery. With Easton, I had to have a C-Section because he was breech. I remember crying after scheduling my C-Section. If you don't go through labor, you can't be a real mom, I thought. I came to terms with it and did fine with the surgery, but recovery was no piece of cake. Before knowing it was twins, I was determined to do a VBAC (Vaginal Birth After Cesarean). After much talk with the doctor, it looks like that still may be an option! I was so glad to hear that. I can't imagine trying to recover from major surgery with two newborns and a 2 year old! I would be so hard to breast feed, too. And yes, I'm going to do that... My mom did it, so I can do it! But anyway, my delivery will have to be a last minute decision. There are just too many variables that will have to be taken into consideration. We made the announcement on Facebook yesterday after we got done with our appointment. It was killing me! I was ready to tell the world. Easton was NOT thrilled about me making him pose with a frame, but somehow I got some cute pics! We are just so excited about this! And by "we," I mean me. Jeremy is excited, too, but he's not at the talk-about-it-every-second-of-every-day point that I am. Men have a different way of showing their excitement, I guess. Alright, I'm done rambling. Next thing I'll be posting about should be our gender reveal! We are going to try Baby Bungalow in Buffalo to see if they can tell the gender at 13 weeks. I'll leave you with another cute picture. 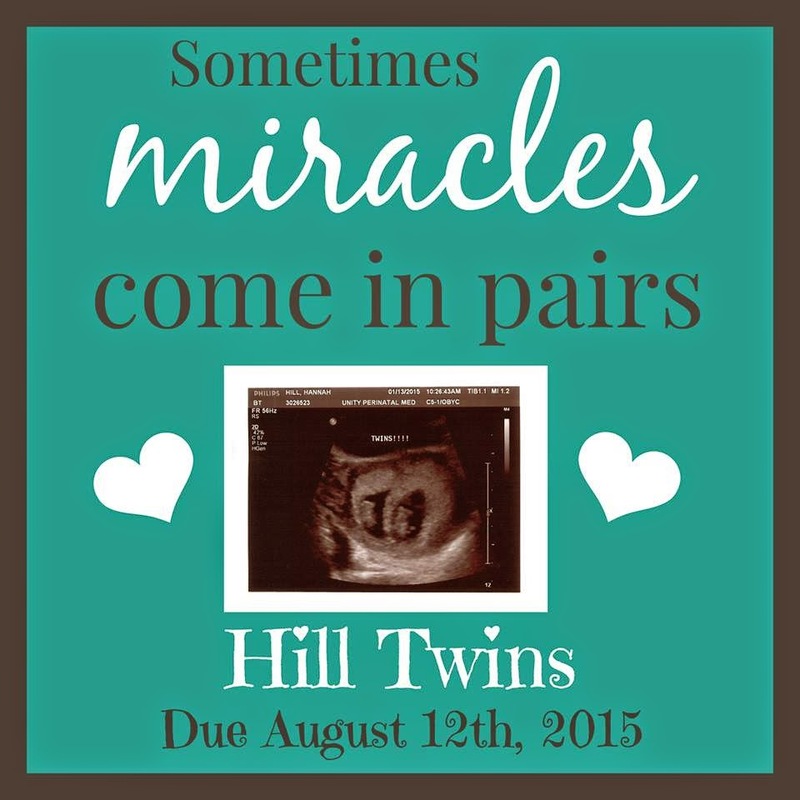 The "Hill Twins" just sounds so great, doesn't it? I anxiously waited until 11:15am, the time of my appointment this morning. Jeremy was meeting me at the doctors so the people at my job wouldn't get suspicious about my "doctor's appointment." We got to the doctor's office, hurried through paperwork (haven't I filled this stuff out before?! ), and waited to be called. My favorite nurse took my weight (boo....) and made me take a pee test. After vitals and chatting, the nurse left and we waited for the doctor to come in. Let's back up a minute. Back in July, after Easton turned one, I found out I was pregnant. We weren't trying, so this was quite a surprise! Two and a half weeks later, I started bleeding. That began the worst month and a half of my life. We had a heartbreaking miscarriage. I tried so hard to be tough, but it broke me. I ached not to just be pregnant again, but for THAT baby. I had seen that heartbeat. I know that sweet baby was in there and alive. It was horrible to know that while I saw a heartbeat, I knew it would be a matter of days before that precious, little heartbeat stopped beating. It was backwards, it was scary, it made me ask "Why me?!". The doctor reassured me that nothing was wrong with my body, she said it was just bad luck. We could go ahead and try again in a month. So, a few months later. I took a pregnancy test on December 5th, 2014, and got a quick blue plus! Here we go again! I was so excited, but I couldn't help but be worried about the possibility of miscarriage. A few days after my positive, the morning/midday/evening sickness kicked in. Oh, what a relief! Pregnancy symptoms are a great sign. Jeremy and I waited until Christmas day to tell our families. It was wonderful. They screamed, they cried... it was perfect. I was 7 weeks and still feeling like crap... a great sign. So that brings us to today, my first doctor's appointment. I loved my appointments when I was pregnant with Easton. Any chance to listen to a heartbeat was a great day in my book. Before the nurse left, she said that the doctor might do a quick ultrasound! Even better. The doctor came in, and she started the ultrasound. It didn't take more than a second for her to see the sac, and that beautiful little blob with that precious heart beating away! What a miracle. I was so excited for Jeremy to be there. He took a video on his phone. I could finally relax. I was 8 weeks with a visible heartbeat: I was one happy, momma. Then the doctor moved the ultrasound wand over the tiniest bit and that was all it took for our lives to be changed. She said, "Oh! You're having twins!" TWINS! Two babies. I saw them both. Two sacs, two babies, two beating hearts. How is this possible? My mom had twins. Isn't it supposed so skip a generation? Don't you only have twins when you're older? Holy cow... TWO BABIES! I was so excited. Jeremy was in disbelief. She printed us a picture, we chatted a little about the pregnancy (most of which went in one ear and out the other... how could I focus? ), and we were on our way. We sat in the car and started making calls. The first call went to Jeremy's sister, Lindsey. After all, she was the one who swore we were having twins. She didn't answer, so obviously next call has to go to my mom. I wish I could have recorded all the responses we got over the next few minutes. Everyone was so happy for us. This was a dream come true! Jeremy and I went to lunch, finished a few more phone calls, and tried to let the news sink in. He said, this is one of those days that we will remember forever. How true. I can't remember what movie it was but I remember the quote. "How many moments in life can you point to and say 'That's when it all changed'?" This was one of those moments. I've heard that after a miscarriage, your next baby is called your "rainbow baby." After a storm, the rainbow appears. It's a sign of hope, and of healing. I prayed for this pregnancy. I asked God for this blessing, and out of nowhere he sends me a double blessing. A double rainbow. I am overjoyed. I know that this blessing can only come from God. He is good. His plan is worth waiting and praying for. 1 Samuel 1:27 "I prayed for this child, and the Lord has granted me what I asked of Him."